My family and I always make it a tradition to go to the CNE (aka "The Ex") every year, for as long as I can remember. Each year there would be new food, drinks or attractions to try out. But we rarely ever waited in line for anything, unless they were giving out free merchandise of course! 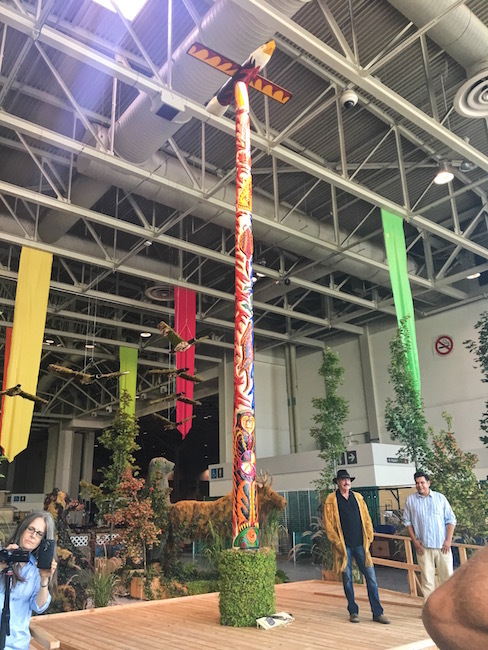 This year, I had the opportunity to attend The Ex on their media day. I was able to try all the new food items, and I also got a sneak peek of the Ice Skating show featuring Elvis Stojko! Below are just a few of my favourites and things for you to look forward to at the 2017 CNE! This was the first item I had and it was probably the best item I had. 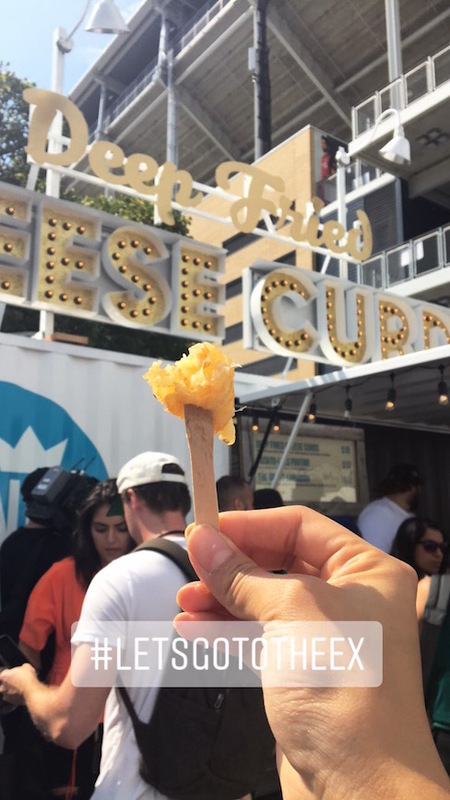 Deep Fried Cheese Curds from The King of Curds, you get to choose from original, maple or potato-less poutine. My personal favourite was the maple because you get that nice sweet and savoury flavour to it. This is an item I would wait an hour for! 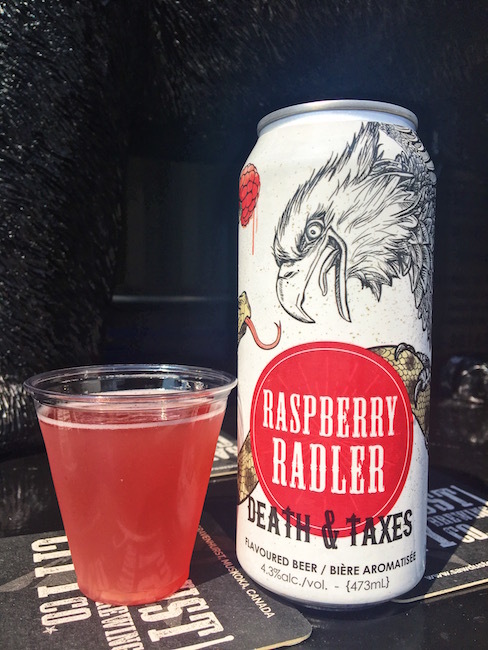 Next up was the Raspberry Radler from Sawdust City Brewing Co.. Unlike most radlers, this one was a lot lighter in flavour - you only get a slight hint of raspberry. It is the perfect drink to have on a hot summer day or while waiting for other delicious foods at The Ex. They also have the Sawdust City Butter Tart beer. Unfortunately, we did not get a chance to try it, but they said it was their best seller and it would be available once The Ex is opened! From HotBunzz, The Juicy Oink! is pork 5 ways. Included was: Pork Shanghai Soup Dumpling (XiaoLongBao), 5-spice pork belly, BBQ Pulled Pork, Sweet Longanisa Sausage, and Chicharron (crispy pork skin). It came on a nice soft bun that soaked up all the sauces so nothing went to waste! If you are a fan of chicken feet at dimsum, then you will enjoy the Deep Fried Chicken Feet from Coco Concessions. Unlike the tradition chicken feet that marinated in sauce, this one is deep fried. It was very light and crispy. They also had deep fried pickle balls with bacon. One of the best burgers I tried was this one: The Southern Slang from Fran’s. Deep fried buttermilk chicken on a cinnamon sweet bun! They also have Peanut Butter Sriracha Bites if you’re still hungry after the burger! For Canada 150, Tim Horton’s brings you the Canada 150 and the M&M Iced Capp, exclusive to The Ex! Last year, Yatai brought us the Original Gangsta and the Alley Bird. For 2017, they combined the two to bring us the Last Samurai. The best of both worlds! If you love Buster’s Sea Cove from the St. Lawrence Market, then you will love these Lobster Arancini Balls from them. Topped off with pesto, parmesan cheese and spicy mayo, this is the perfect snack to have in-between rides. 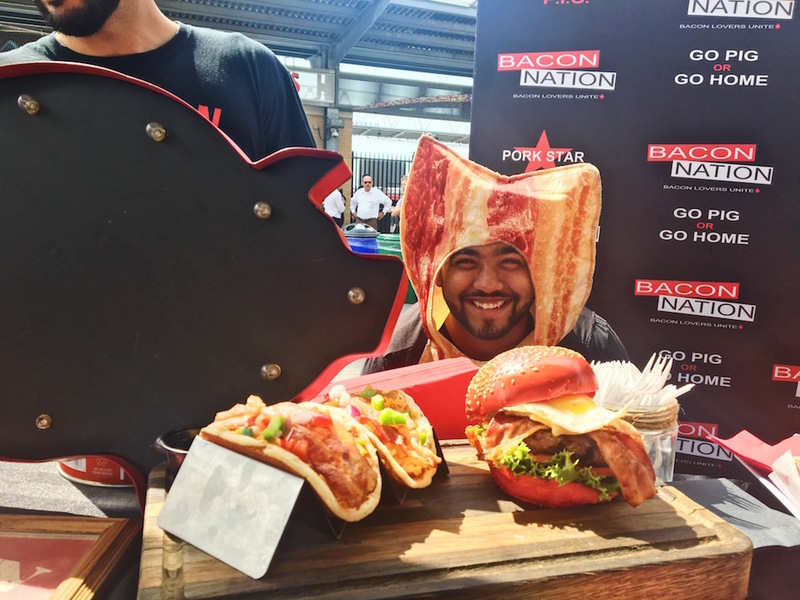 Bacon Nation is back at it again, but this time with Pancake Bacon Tacos and the All-Canadian Red Hot Burger - bacon pictured is not included. What’s better than bringing food and science together? Dragon’s Breath Crepe’s of course! 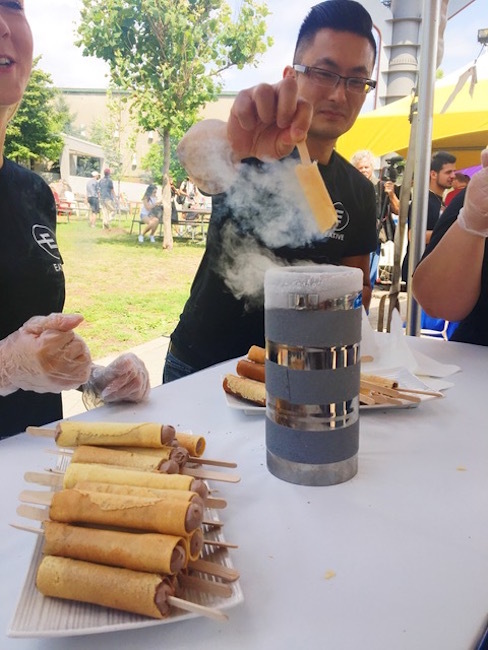 Eative brings us crepes filled with a variety of flavours, dipped into liquid nitrogen for that dragon’s breath effect. Seeing this cheese ooze is making me drool. Pictured is the Fried Mac & Cheese Chimichanga from Farm to Fryer. Do bugs creep you out? Want to conquer your fear and assert dominance? 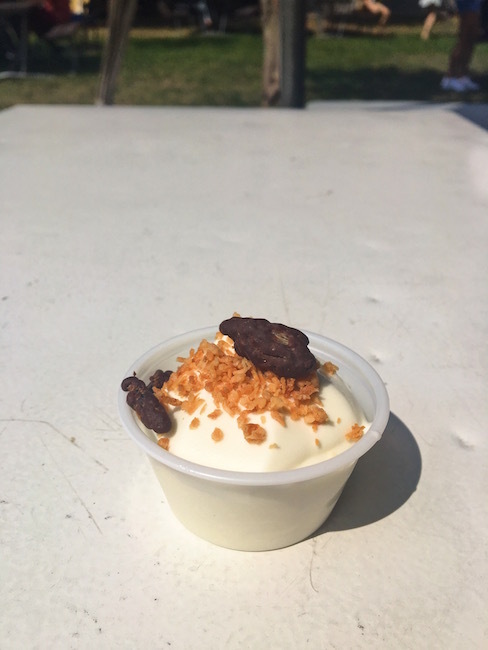 Well Bug Bistro brings us a nice cool Cricket Cones, topped off with chocolate covered crickets - MMM MMM MMM! Dutch Frites is bringing us some brand new twists. I tried their Indonesian inspired poutine which was topped off with a peanut sauce and shrimp crackers! For all our Vegan friends they're also serving a 100% vegan poutine (pictured)! GO BIG OR GO HOME: This is the Colossal Coliseum from Italian Sandwiches. If you just finished a TFC Game or you’re building an appetite from walking around, look no further. This is the burger for you: breaded veal and a pulled pork panzerotti on a kaiser bun with sweet BBQ sauce, creamy slaw and jalapeños, topped off with two deep fried brownies for dessert. WOW. Chloe’s doughnut Ice cream gives us the ultimate ice cream experience. Why have your ice cream in a regular cone when you can get it in a churro or a freshly baked donut? Each year I make sure to get the 99 cent spaghetti from Primo. It’s the best bang for your buck! 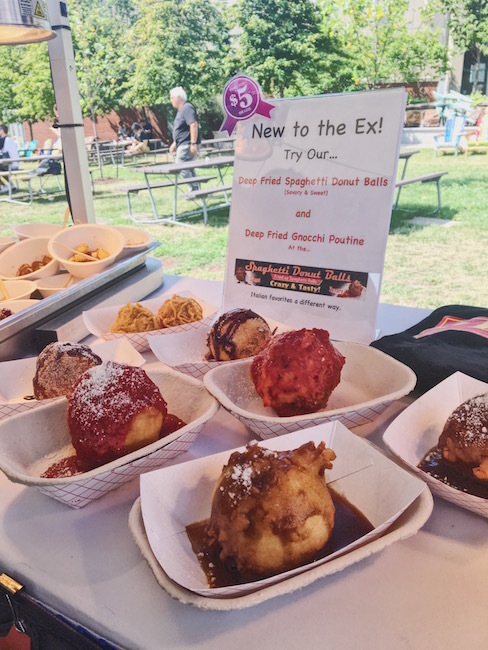 but this year, they decided to add in deep fried spaghetti donut balls, offered in three flavours: regular marinara, chocolate and icing, or gravy! Last but not least was Sugar Mountain from Cake Shack. A brownie stacked with a scoop of cheesecake and a sugar cone dipped in white chocolate, confetti doughnut, cotton candy and just a LIGHT dusting of powdered sugar cause y’know, wouldn’t want to overdo it right? Overall, I had a great time and I am looking forward to the next two weeks to try out other exciting things! Outgoing dog-lover looking to explore all of Toronto’s best dishes!